Renaissance pudding recipes include puddings that are either boiled or baked. 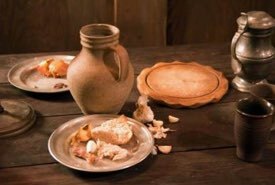 The earliest Medieval and Elizabethan puddings were boiled in sausage casings or stomach linings. 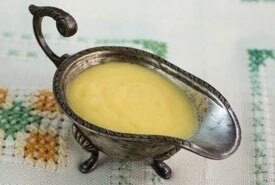 However, by the mid 17th century, many custard-based and cake-like puddings sweetened with sugar and fruit were being boiled in special pudding cloths or baked in deep, buttered dishes like the puddings featured on this page. Enjoy trying these historical dessert recipes. The puddings are easy to make, delicious, and perfect for serving at a Renaissance dinner or theme party. 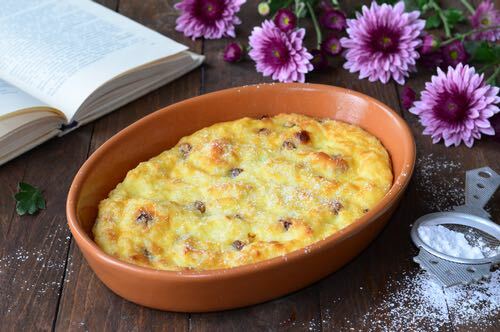 This Renaissance pudding recipe is an early example of a rice pudding. Take three Pints of Milk or more, and put therein a quarter of a Pound of Rice, clean waſhed and picked, then ſet them over the fire, and let them warm together, and often ſtir them with a wooden Spoon, becauſe that will not ſcrape too hard at the bottom, to make it burn, then let it boil till it be very thick, then take it off and let it cool, then put in a little Salt, ſome beaten Spice, ſome Raiſins and Currans, and ſome Marrow, or Beef Suet ſhred very ſmall, then butter your Pan, and ſo bake it, but not too much. This is a fine example of an early bread pudding recipe. 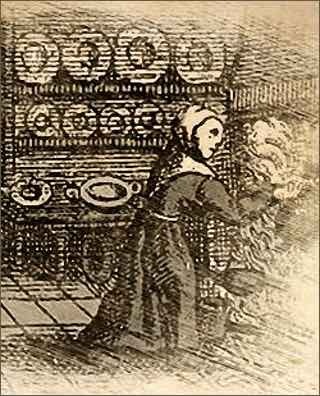 Take a Manchet, put it into a Poſnet, and fill the Poſnet up with Cream, then put in Sugar and whole Spice, and let it boil leiſurely till all the Cream be waſted away, then put it into a Diſh, and take ſome Roſewater, and Butter and Sugar, and pour over it, ſo ſerve it in with fine Sugar ſtrewed all over it. Your Manchet muſt be chipped before you put it into the Cream. 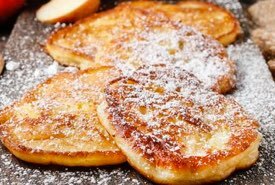 Take the rind of a ſmall one pared very thin, and boiled in ſeveral waters, and beaten very fine in a Mortar, then put to it four Ounces of fine Sugar, and four Ounces of freſh Butter, and the Yolks of ſix Eggs, and a little Salt, beat it together in the Mortar till the Oven heats, and ſo butter a diſh and bake it, but not too much; ſtrew Sugar on it and ſerve it to the Table, Bake it in Puff-paſt. Spread the flour and butter mixture onto a linen cloth, then wrap the pudding in it for boiling. Take a Quart of Cream and boil it, then put in ſome Almonds blanched and beaten, when it is boiled and almoſt cold, put in eight Eggs, and half the Whites, with a little grated Bread, Spice, and Sugar, and a very little Salt. Then wet Flower and Butter, and put it in a Cloth and boil it, but not too much, ſerve it in with Roſewater, Butter and Sugar, and ſtrew it with ſmall French Comfits. If you have difficulty reading the Early Modern English style of writing with its quaint ſ character or need to shed light on any outdated ingredient names and cooking methods, then view my handy Glossary of Historic Cooking Terms. Supplies such as Gum Dragon and 23kt edible Gold Leaf are not easy to find locally, so here's some helpful suggestions for getting the historical ingredients you need to prepare your own Renaissance banquet or fair. Just click the button below.